Above is a close up of my Apple Blossom Clematis, an evergreen type that I planted as a 2 foot tall sprig two years ago. 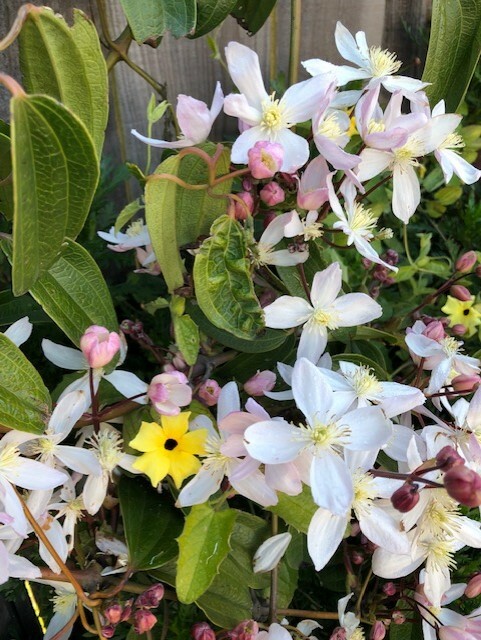 It has quickly grown to 6 feet tall and then over the fence, plus about 8 feet wide along the fence and has a delicate apple scent. 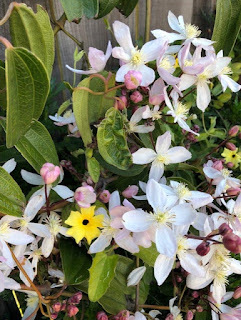 The white flowers are the clematis, and the yellow flowers are Yellow Clock Vine. I ordered the clematis from a catalog, they are more rare than the clematis that lose their leaves, which I also have. Above is my Red Star Magnolia, also about 2 years old. It was about seven feet tall when planted. I think red magnolias are found a little less often than white. Star Magnolias are noted to be smaller than other magnolias, and often reach only 12 to 15 feet tall so are a great size tree when you don't want it to dominate your garden, size wise. I am thinking perhaps this is NOT a star magnolia because of the flower shape. The trees I had planted by a landscaper had ID tags on them, and when I went out to write down the details, a worker had taken off the tags and thrown them out, which irked me! 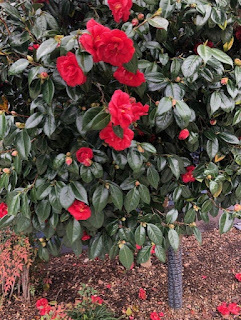 Above is a handsome red camellia in bloom at my church. We have many of these growing there, maybe fifty. Maybe I will count them someday. I am having a landscaper plant 3 camellias in my back yard, in 3 half oak barrels. I don't know when yet, we have to choose a schedule. He is also going to create a 100 square foot flagstone patio in my front yard for a sitting area that faces west, a nice place to sit in the afternoon or evening, and has a view of the sunset. 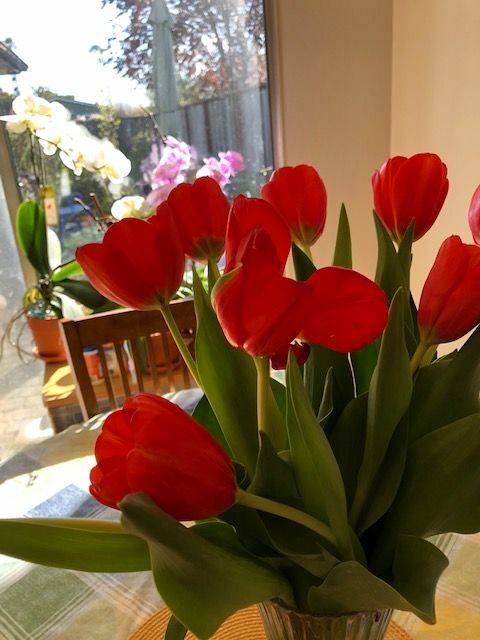 Above is a bouquet of orange tulips I bought, they sing of spring to me. Do you sometimes want to do something different, to add something to your activities? I heard about a Book Discussion Group held in a city recreation center, all are welcome and it is for people age 45 plus. That is me! Sorry for those younger folks, maybe you could sneak in, ha ha. I went for the first time this week and the next book we are reading is "Daughter of Fortune" by Isabelle Allende. I started reading it right away and like it thus far. At each meeting we vote on the next book to read, and choose books available as book kits from the library, so we don't need to buy the books. Nineteen ladies and one man attended, and each person has about two minutes to say what they like or dislike about the book. Earlier they read two books I love: "Bel Canto" by Ann Patchett and "The Year of Magical Thinking" by Joan Didion. To answer two questions left in comments, we meet in a building owned by the city, not in people's homes, and no refreshments are served. Since the meeting was only for one hour, the time flew by. Happy reading and gardening this spring to you all. Gorgeous flowers! Especially the tulips. I love all your gorgeous flowers! You will certainly enjoy having a flagstone patio! We don’t have a clear view of the sunrise or sunset at home but I love the views down here in the country. A book club would be fun! It would encourage one to read allmanner of different books! Plus an incentive to read them faster! I hope you have fun at yours. I’m guessing they serve refreshments? And are the meetings at different homes or all of them in the library? Trying something new is fun! Your flowers are beautiful. Interested in the apple clematis. Looks fabulous. The yard behind ours has an old Clematis of the kind you describe, evergreen and blooming right now. It looks fine from a distance but closer up it is rather shaggy. Maybe it needs some pruning. I like the idea of a book club for people over a certain age and also that the books are provided by the library. What a great idea. Thanks for sharing the pictures today. They are an inspiration and I can hardly wait until the weather here warms up and everything grows and blooms!! I love Spring flowers! That is a pretty clematis, I never heard of that variety. The book club sounds like fun. No, I don't think that's a star magnolia. But your garden sounds as if it will be lovely when the paving is down. Beautiful photos of beautiful Spring flowers. I love to try new things! I am currently taking a watercolor class and I have NEVER had an art class in my life. I really enjoy it and learning from the experienced painters. Glad you found the book club--sounds like it will be fun. I attended a book discussion group once and enjoyed it. But I have to say, I prefer to read what I want to read when I want to read it more. So I didn't return. Also the group I attended had been around for awhile and you could tell there were folks whose opinion of themselves was pretty high. It sort of put me off. SO pretty. Love the tulips. Hope you have a great new week. Love your flowers...that first one, the apple blossom clematis, is unusual and very pretty. 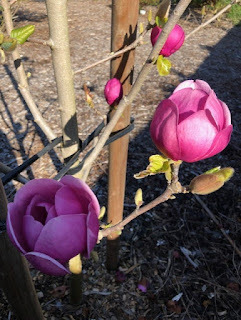 Also love the red/pink magnolia blossom. Tulips are a wonderful spring blessing. We can't grow them here in Florida, but they are usually available at the store to enjoy. Your book club sounds good...I like that you don't have to buy the book. I appreciate my library so much...they have kept me reading since I retired three years ago...and I never seem to run out of good options there. Haven't joined any clubs, however. Then I might feel like I am having to "work" at my pleasure reading. However, it might be a good way to meet people and enjoy some good times of intellectual exercise. Maybe I will think about that after all. Always needing ways to keep my brain working. Your flowers are just beautiful, how fortunate you are to be enjoying the beauty of flowers in April! We do have some tulips coming up, but it's still very cold here in Idaho. Thank you for sharing though, I love to enjoy and look at them, I can only imagine how fragrant some of them must be! Such gorgeous flowers. So far I have only found a small patch of crocus in bloom last week around here. It’s still too cold at night for anything to grow. Your book club sounds interesting. I have never done anything like that but I do love to read. Beautiful flowers. Sounds like a neat group and a great opportunity to meet people. I can't add another thing to my plate just now, with my dearest being so sick and tired of being tired. Hopefully the answers are coming soon. In the meantime he rests and sleeps, and that leaves me with the chores...which is find...I don't mind at all, I just want him well. In God's good time...so we wait. Your flowers are lovely. Several people are posting Spring... I love it. New here! Wow....those flowers!!!!! Beautiful. I love book discussions. I host one weekly. The Spring flowers are looking nice. Enjoy your Book Club. The flowers are beautiful. It sounds good to me to meet in a public place. And for just an hour. I am going to join something different here in our town. I don't remember exactly what it is called, but it is all about rocks and gem stones. I have been collecting rocks for a while and want to learn more about them. The desert is full of amazing things. Your pictures are a nice shot of spring pleasure as I am in the middle of a blizzard today. Glad you have enjoyed your book club experience. I imagine the time allotment makes you really think about what you will say--everyone, for that matter! Hi Terra. Love all your flowers, especially the apple blossom clematis. Lovely. Guess what? I belong to a book club too. We are Reading EDUCATED. Powerful book. Check it out. ThNk you so much for your visits. Your book discussion group sounds just right! Gorgeous blooms, Terra. Nothing here but snow and it's been far too cold for anything to grow but for a few daffodils in my garden. I'm patient though. I think it's great that you are getting out and into activities. I've often wanted to join or start a smaller bookclub. That would be best for me with my hearing impairment. But good for you!! Thanks for your visit, my friend! So beautiful these flowers ! I like this season when everything starts blooming ! Your flowers are too beauriful, Terra! Great idea to join a book group. I might do that one of these days!